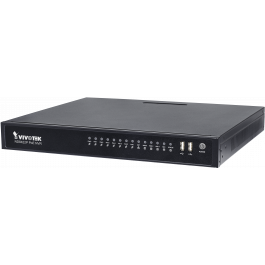 VIVOTEK ND8422P is a Linux embedded 16-CH standalone NVR with 8-port 802.3af Compliant PoE, allowing connection with PoE cameras for a max. 120 W power supply. 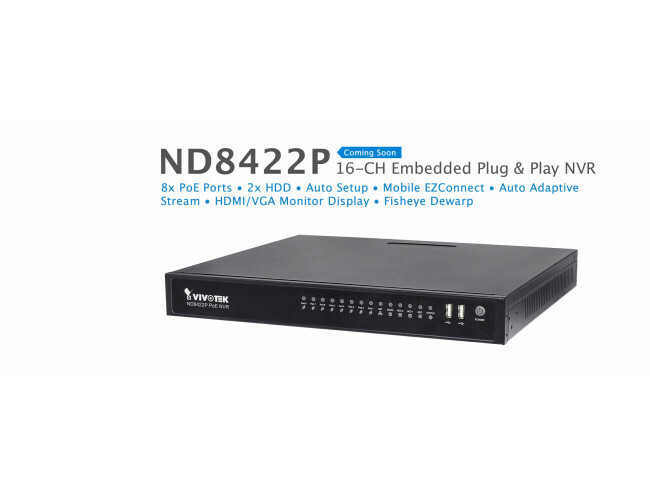 ND8422P also features "One Button Setup" with its plug- &-play and auto-setup functionality, making this advanced unit surprisingly simple to install, and suitable for any small-scale video surveillance applications. Supporting HDMI and VGA local video output, users can control the GUI OSD interface via mouse & keyboard, eliminating the need for a separate PC to search video or to playback from the NVR. The new local display design - Auto Adaptive Stream will dynamically modify Stream 2 resolution of a camera to best fit the display resolution according to the layout type, resulting in an efficient display, while maintaining superb image quality. Meanwhile, ND8422P supports software fisheye camera de-warping function, providing right angle of video view and detailed information for usage. 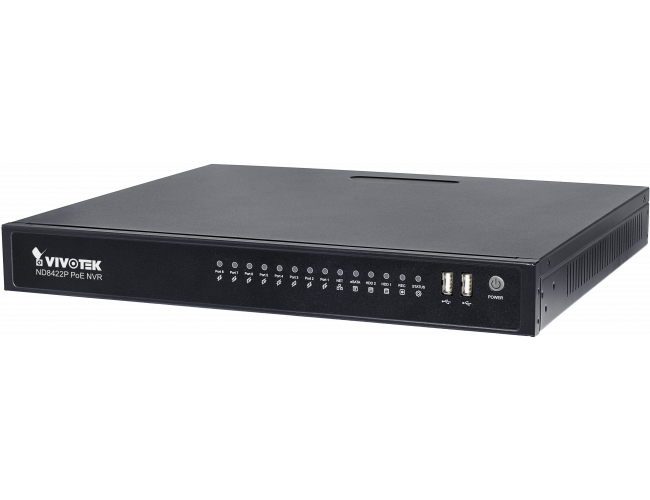 What's more, ND8422P, featuring various I/O ports, such as eSATA port, alarm input/output, RS232, and RS485 provides users great flexibility of applications. With VAST CMS, users can set up IP surveillance system with ease. For remote and mobile access, VIVOTEK also provides EZConnet and iViewer app, for both iOS and Android handheld devices, enabling users to monitor live video anytime, anywhere. 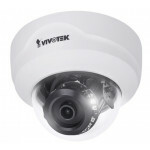 ND8422P also features "One Button Setup" with its plug- &-play and auto-setup functionality, making this advanced unit surprisingly simple to install, and suitable for any small-scale video surveillance applications. ND8422P provides LiveView and PlayBack fisheye dewarp video with four display modes (1O, 1P, 1R, 1O3R), allowing users easily to monitor right angle of video view and detailed information for usage. With EZConnect, there is no need to configure an IP port on the router or to set up a DDNS address for the NVR. In fact, the user doesn't even need to know the IP address of the NVR. EZConnect will automatically manage all the network parameters needed to connect your network. The Storyboard interface provides a glimpse of past recordings over a timeline. User can easily search for particular video footage and find specific events quickly. What's more, ND8422P, featuring various I/O ports, such as eSATA port, alarm input/output, RS232, and RS485 provides users great flexibility of applications. With VAST CMS, users can set up IP surveillance system with ease. For remote and mobile access, VIVOTEK also provides iViewer, for both iOS and Android handheld devices, enabling users to monitor live video anytime, anywhere. *It is highly recommended to use standard Cat. 5e & Cat. 6 cables which are compliant with the 3P/ETL standard.